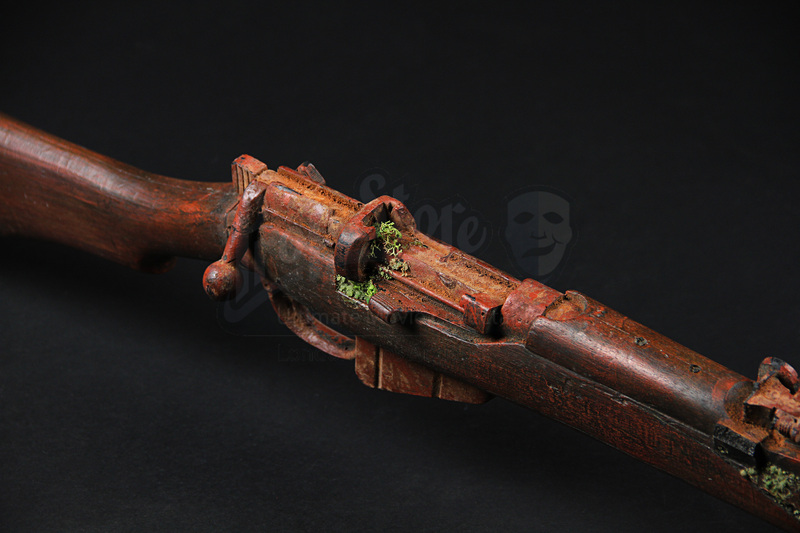 A stunt Enfield SMLE rifle used in the production of the action adventure film Sahara. Diving for a maritime heritage agency, diver Dirk Pitt (Matthew McConaughey) rescues World Health Organisation doctors Eva Rojas (Penelope Cruz) and Frank Hopper (Glynn Turman), who are investigating a strange disease in the region. Hunted by local troops and corporate assassins, the group stumble upon a massive conspiracy – as well as lost treasure from the US Civil War. This rifle and others like it were used by the Tuareg horsemen who come to Dirk’s aid during the film’s exciting finale. Made of hard black rubber with a metal armature for strength and rigidity, the high quality of casting means that many of the rifle’s features, including stampings and original markings, are all visible in the rubber. Metal loops have been added for sling swivels to allow for slings to be attached to the weapon. The piece is finished in brown with reds and greys used to make the steel portions of the weapon look rusted and worn. Some damage is present on the rifle, with wear to the sights and additional distressing to the rifle’s stock and receiver. However, in spite of this wear, the weapon remains in overall good condition.